Create a better website for you and your patients. Engage patients and showcase your hospital or clinic with a powerful new website. Get started today. Use beautiful design and easy access to useful information to build a strong connection with your patients. We create HIPAA-compliant sites with pre-registration forms and secure access points to patient portals. Our intuitive manager provides quick access to editing site content. Plus, we provide training and supplemental materials as you learn how to manage your site. Whether you represent a large hospital with a full marketing staff, or are part of a small specialist practice, we strive to make websites easy to maintain by anyone. Make your site ready for any device. 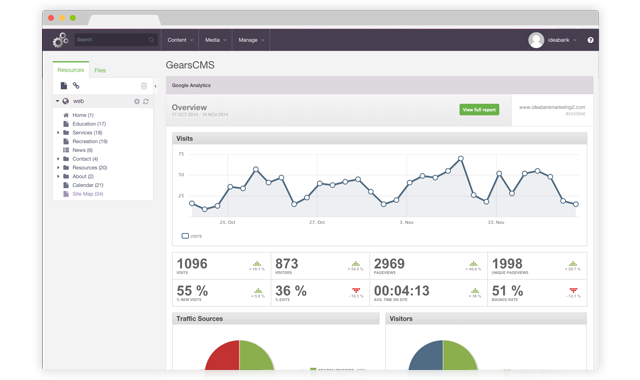 We design and develop fully-responsive, mobile-friendly websites. Your site will automatically adapt to any mobile phone, tablet, laptop or desktop screen. You won't have to manage a separate mobile website; update a page on your main site and watch the change appear on all devices. Plus, we don't use templates, so you can be certain your design will be unique to you. We start from scratch on each project, making sure design elements and messaging are tailored to your organization. 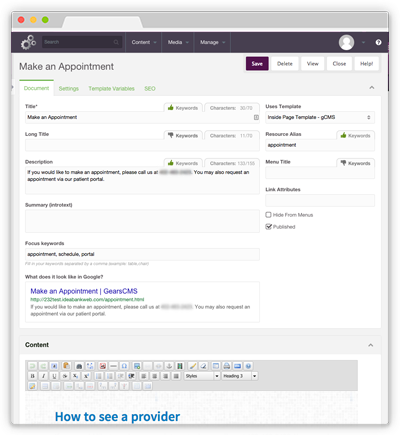 We'll even work with your third party providers, including patient portals, to integrate your design. We'll develop a site that builds your brand, engages patients, and connects with your community! Our custom-designed sites will make an instant impact with potential patients, giving your new site the potential to be the centerpiece of your marketing plan. We'll help you add social media, email marketing, and public relations to the mix, and can even take your plan to the next level with automated publishing. Every site we develop comes standard with a news system and online gallery. We will also incorporate your social messaging, email marketing, or third party patient management systems. With our InMotion marketing program, we will develop content for you; keeping your messaging – and website – up-to-date. Fast, secure and always HIPAA-compliant. Our servers are SSAE 16 SOC-1 Type II compliant and offer unmatched speed and reliability. We take security seriously, performing regular security audits on code and processes within the system. We ensure any possible issues are patched, and have checks in place to identify and report suspicious behavior. Regular backups and monitoring keep your site safe. IdeaBank Marketing has a long history in website development for the healthcare industry. Whether you're a dental practice or a hospital, we know patient privacy is not only a concern, but a requirement. We ensure your site, and any special functionality you request, is developed to be compliant with HIPAA regulations. 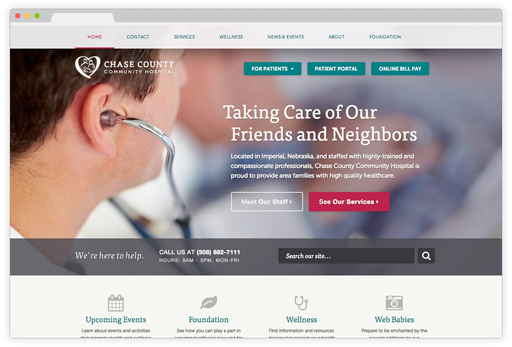 From dated and disorganized to modern and inviting, we rebuilt the Chase County Hospital website to reinforce their commitment to local care. 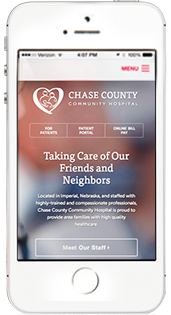 Chase County Community Hospital in Imperial, Nebraska, wanted their website to be a more valuable resource for patients, make a stronger impression on prospective employees, and better reflect the quality care they provide. IdeaBank helped them reach these goals. We begin every project by getting to know our new partner. 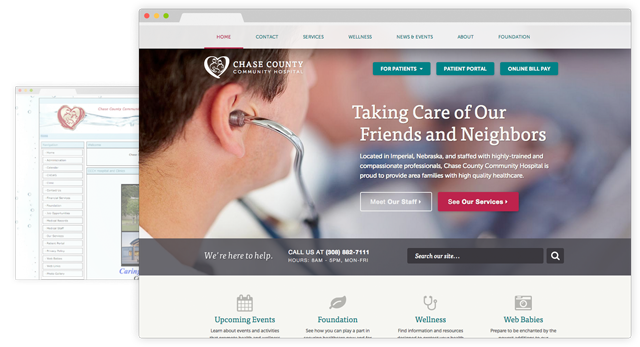 We learned that CCCH needed a site that was valuable for patients, attractive to potential hires and featured a more modern design. ...is a trusted healthcare provider. ...peace of mind for hospital staff. "The creative brains at IdeaBank provide marketing advice and develop materials for our rural hospital with expertise, efficiency and professionalism. "Our 20-year relationship has been one of solid trust, where I always feel like I am their only client." We're a full-service advertising agency in Central Nebraska, providing marketing strategy, creative services and web development. We've been helping hospitals and clinics for more than 30 years and believe a solid marketing strategy is the basis for every successful organization.